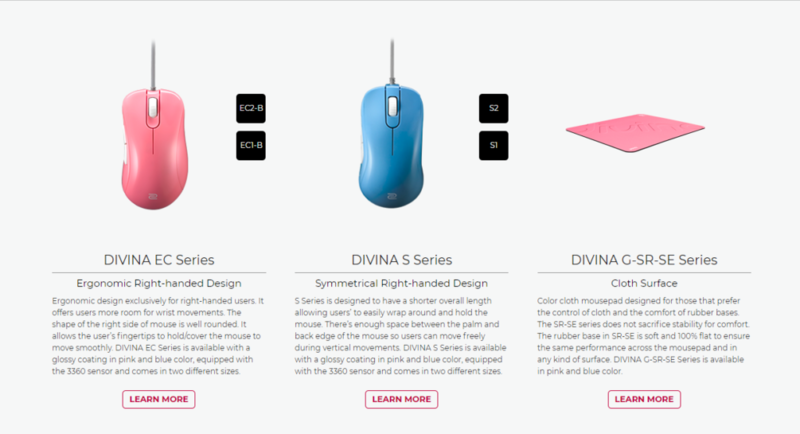 We were browsing through the ZOWIE Webpage and we stumbled upon the ZOWIE DIVINA Series. There have been a lot of rumours going around that they would be releasing a new set of peripherals this quarter but we didn’t expect it to be like this. Judging by the way it looks, it is a remodeled EC-series and ZA-series marketed towards the female gender brought about by their soft colours. Although, knowing ZOWIE, they don’t like to categorize their products, hence they would likely be marketing this towards youngsters set to enter the eSports scene or just to flash it up without having to add the usual RGB colours. All we know for now is that these have the 3360 PWM sensor and 2 size variants. While the DIVINA mousepads are likely the same texture and size, just with different colours and print. It seems this release isn’t quite recent as there has already been a tournament held at almost the same time as the ZOWIE xTREMESLAND 2018 series. There are still a lot of questions that have been left unanswered and it seems the ZOWIE representatives have not yet been briefed about the DIVINA series. For now we are trying to reach them through their new ZOWIE Divina Facebook Page.